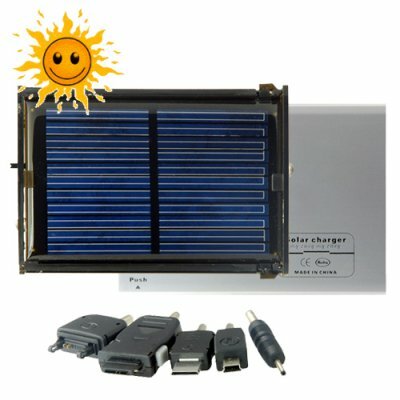 Successfully Added Premium Solar Charger with Metal Casing and 8 Adapters to your Shopping Cart. It's the ideal green gadget for those on the go! This premium solar charger really sets itself apart from the rest with its robust metal casing. It's perfect for where you'll find yourself when you need to use it the most - the outdoors. Durable and rugged, slide open the sand polished metal cover to expose its powerful solar cells to the sky. Efficiently harness the limitless power of the sun in order to power all your portable electronics. From cellphones, digital cameras and video camcorders, to MP3/MP4 players and gaming devices! The amazing CVEWT-813 comes with a rechargeable built-in lithium battery to store up excess solar energy. That way it is a back up power supply as well as a being a continous energy source. You'll find this feature invaluable when you have a really important call to make, need to take that all important photo, or need some more footage for that unexpected video that's guaranteed to become viral once it hits Youtube. This cool solar gadget come with 8 different adapters allowing it to work with most mobile electronic devices and remarkably begins charging after only 3 minutes in the sun! Most importantly, it's lightweight and can easily fit into your shirt pocket for true portability. Buy one now to add more power to your modern lifestyle and then pick up a dozen to sell on eBay. Brought to you by the online leader in direct from China wholesale electronics - Chinavasion. Buy in pairs to save on shipping! What kind of devices can I charge with this premium solar charger? You can charge cell phones, digital cameras, MP3 and MP4 players, and numerous other gadgets. Yes, i have bought this solar charger and it is actually pocket size , easy to carry, simple to use and works well.Good job.I intend buying another one to be able to charge my laptop. EXCELENTE PRODUTO. VALEU A PENA COMPRAR.